In the US, kidney stones account for more than 500,000 ER visits each year. About 1 in 10 people will have a kidney stone in their lifetime. Of these people, 1 in 2 will develop a second kidney stone in the future. Kidney stones are made from minerals and salts that are dissolved in the urine. When these are in high concentrations, a stone may form. The most common type of kidney stone is composed of calcium. A kidney stone may stay in the kidney without causing symptoms, or it may try to pass through the urinary tract. As a kidney stone passes from the kidney to the urinary bladder, it may block the flow of urine. This can result in severe pain. Kidney stones may be found before the onset of symptoms. Asymptomatic or ‘silent’ stones are found on abdominal ultrasounds (US) or X-rays are taken during a health exam. These stones may never cause any symptoms. However, one cannot predict if, or when, that may change. Kidney stones are also diagnosed when you develop sudden back or abdominal pain, or blood in the urine (hematuria) and medical attention is needed. 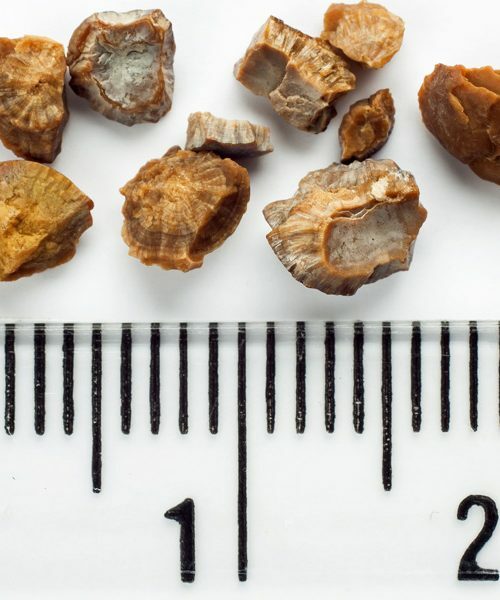 These kidney stones are diagnosed with a US or CT scan. These tests can identify the size and location of the stone, which will be needed for treatment planning. Kidney stones can be treated in different ways. Treatment options depend on the type of stone, the severity of symptoms, and the duration of symptoms. At South Florida Urology Institute, we can formulate the best treatment plan for your specific needs. Small stones are capable of passing without treatment. If the stone is small enough, it is reasonable to allow a period of time for passage. This is an option if your pain is bearable, and there are no signs of kidney failure or infection. During this time, you should increase your fluid intake. Sometimes, your doctor will prescribe pain medication or medication to help the stone pass. Shockwave lithotripsy is a non-invasive treatment option that uses sound waves to break the stone into smaller pieces. This can make it easier for the stone fragments to pass. This procedure is performed under general anesthesia. This is the least invasive option to treat kidney stones. Laser lithotripsy is a very effective treatment option to break hard stones or stones that are invisible with standard X-rays. Under general anesthesia, a small scope (ureteroscope) is passed into the urinary tract. The stone is broken into small pieces with a laser fiber. Ureteroscopy is an endoscopic procedure performed through the urinary tract. There are no incisions made during this procedure. Percutaneous nephrolithotomy is a procedure reserved for large kidney stones or patients with complex anatomy. This minimally invasive procedure is performed under general anesthesia. A small tube is placed through the back and directly into the kidney. Patients who undergo this procedure spend one night in the hospital and typically go home the next day. After treatment, tests can be performed to find out what type of stones you are making. Certain diet changes or medications can help prevent new stones from forming. Here are a few strategies to lower your risk of making a kidney stone. A common cause of kidney stones is dehydration. If you aren’t making enough urine each day, you may be at increased risk of developing a kidney stone. Staying hydrated is the most important way to prevent kidney stones. Water or low-calorie drinks are best. Your doctor can help you find the best strategy for staying hydrated. Too much dietary salt (sodium) causes the urine calcium level to be too high. Furthermore, eating too much sodium also puts you at risk of developing high blood pressure, heart disease, and stroke. Sodium is found in many canned, pre-made, and fast foods. The Center of Disease Control (CDC) recommends less than 2,300 milligrams (mg) of sodium per day. One teaspoon of table salt contains 2325 mg of sodium. Make sure you are getting the daily recommended amount of calcium that is right for you. Too much or too little calcium may increase your risk of kidney stone formation. The best sources of calcium are also low in sodium. Dairy products are rich in calcium, but many non-dairy foods are fortified with calcium. Check with your doctor or dietician to make sure you are consuming the amount of calcium that is right for you. Fruits and vegetable contain antioxidants, magnesium, and citrate which can all help prevent kidney stone formation. Be careful – spinach contains high levels of oxalate. Sometimes, diet changes are not enough. Talk to your doctor about finding the prevention strategies that are right for you. Disclaimer: This page is for information purposes only and does not replace the advice from a medical professional.